Please note: Range only memberships are sold out for the 2016 season. You may still become a member to shoot, however, you must purchase a full membership ($70, not $35 or $40). Sorry for any inconvenience! 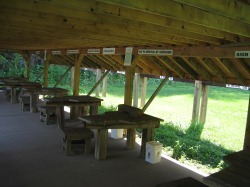 Our rifle range was renovated in 2004. It is fully covered and is state of the art. 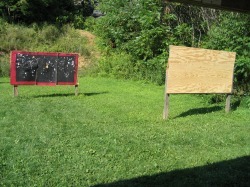 The targets range from 25 to 100 yards. 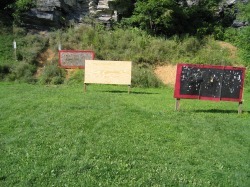 The pistol range has targets from 5 to 25 yards, and there is also a 25 yard shotgun target. We close the range for 3 days out of the entire year, which is Opening day of fishing in April, and contest weekend for fishing in June. Specific dates are located on the back of your membership card yearly. 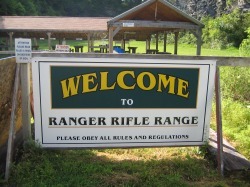 Please note: 50 Cal centerfire rifles and automatics are not permitted at the range, they cause way too much damage! Please respect our club and follow the rules! Please DO NOT shoot at the posts. Plywood is expensive but the wooden posts are even more expensive, therefore DO NOT SHOOT AT THE POSTS! If you want to continue to have a nice range we need your cooperation. Members who see another person shooting at the posts should turn their names into one of the Board members or report them to someone in the clubhouse. If you would like to volunteer to help at the range or would like to donate plywood or other materials, please contact the clubhouse or come to one of our monthly meetings the first Wednesday of every month! 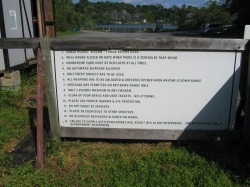 Please read regulations on the back of this sign. Please read this when you get to the range. 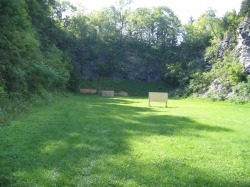 rifle range. from left to right- 100yd, 75yd, 50yd. 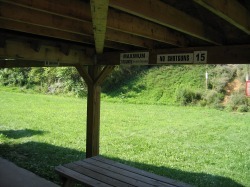 pistol range with shotgun on the left.